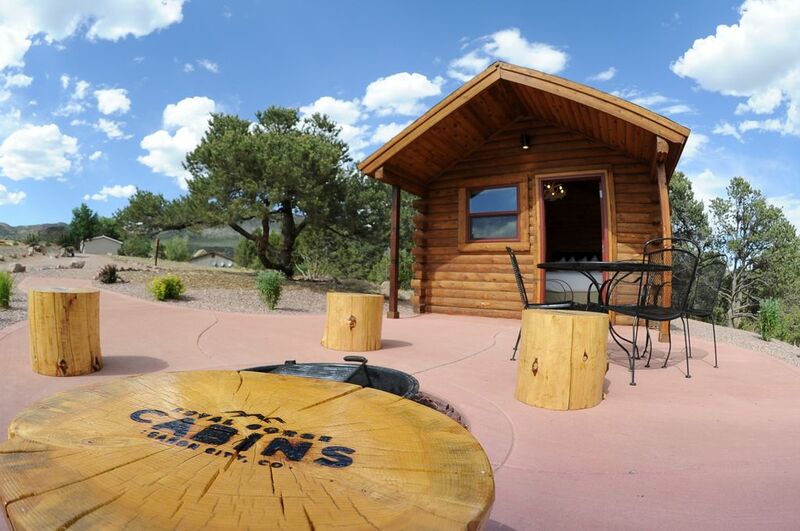 Luxury camping is the best way to describe our Pine Creek Cabin rental. Your private patio includes a fire ring with cooking grate, a table and chairs, as well as furniture grade stumps for seating around the fire. When you're ready for more comforts, retreat to the cozy log cabin with an ultra comfy queen bed with luxury linens and pillows. A faux chandelier antler provides lighting and the evaporative cooler will quickly cool the cabin on warm evenings. A heater is available for cooler evenings, and multiple power outlets and Wi-Fi take the 'rustic' out of your camping experience! A shared shower house is located approximately 300 feet from the cabin, and this unit is one of our most private and quiet glamping options available at Royal Gorge Cabins. Bathroom includes flush toilets and showers located in a shared bath/shower house. An evaporative cooler, or 'swamp cooler' will quickly cool the cabin. Fire ring with cooking grate is located on the private patio. Table with chairs is located outside on the private patio. The private patio just outside the cabin includes furniture grade wood stumps for fireside seating.